The bank and mobile network operator have partnered for the launch of the country’s first NFC payments service, using BlackBerry NFC phones as well as NFC stickers. QNB AND QTEL: "Supporting Qatar's vision of becoming a digital economy." Qatar National Bank Group (QNB) , carrier Qtel, Oberthur Technologies and MasterCard have begun field testing an NFC payments service in Qatar, with the aim of launching a commercial NFC service “soon”. 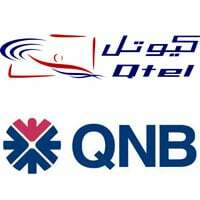 QNB and Qtel customers will have the option of upgrading their existing mobile phone to an NFC phone such as the Blackberry 9900 or 9790 or obtaining a PayPass sticker that they can attach to their existing mobile phone, the partners say. Customers who already have a PayPass compatible NFC phone will be able to simply request a replacement QNB PayPass-enabled Qtel SIM card. QNB customers can sign up for the service and receive a free NFC SIM or QNB sticker at the bank’s branches at City Center, The Mall, Villagio or Landmark. Those choosing the NFC SIM option will then visit their nearest Qtel shop in order to swap over their SIM and get the new service activated. Customers will be able to link their NFC phone to a QNB MasterCard credit card account in order to fund their mobile payments. Purchases under QR100 (US$27.47) can then be made without the need to provide a signature or PIN. Higher value transactions can also be made, but a PIN will then need to be entered to secure the transaction. To support the rollout of NFC services, QNB is to also begin equipping merchants with NFC compatible contactless payments terminals. The initial focus will be on locations such as cinemas, coffee shops and food stalls within large malls, starting with the City Center mall in Doha and then extending to other malls in the city.